Here’s what our fabulous featured author, Victoria Abbott Riccardi has to say about our last Cook the Books roundup. “First, I am honored and delighted that you chose my book for your group. I was so glad to read from your various members that Untangling My Chopsticks either brought back fond memories of their time in Japan or sparked the desire to go there. Japan is, indeed, a magical (and very tasty!) place. Choosing a Cook the Book winner was very hard! Everyone had a fascinating story to accompany the recipe they made and it was obvious that people put significant time and energy into creating something pretty and tasty. I know that it’s not always easy to find Japanese ingredients, so substitutions are often necessary. Since you left the criteria up to me, I decided I would choose a winner based on who best managed to get into the spirit Japanese cooking, both in terms of the recipe they submitted and their story. As I said, this wasn’t easy. In the end, however, I chose Glennis of Can’t Believe We Ate. Glennis ran the culinary marathon, so to speak, by preparing her four-course feast. She really seemed eager to create an authentic Japanese meal, beginning with her dashi soup and ending with the very impressive shabu-shabu! I also loved her genuine enthusiasm as she described the various dishes she made. Congratulations, Glennis. I am so glad you enjoyed my book and preparing your various dishes. What a lovely way to ring in the New Year, which, for all of you I hope brings many memorable moments around the table. Congratulations Glennis! Johanna will be sending you your Cook the Books Winner blog badge and I’ll get you listed in our pantheon of CTB winners in the righthand sidebar toute de suite. And thanks for our wonderful author and guest judge for taking us on an armchair visit to Kyoto and for taking the time to check out our blog posts. Winter weather got you down? 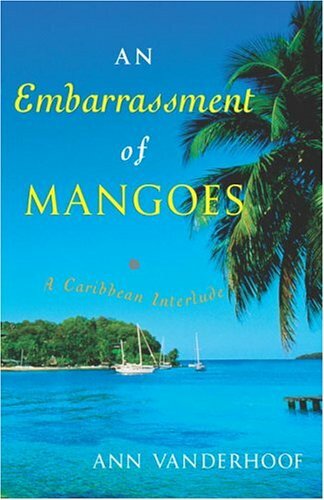 It’s time to crank up the steel drum music, pour a tall rum cocktail, put up your feet and escape on an island adventure with “An Embarrassment of Mangoes: A Caribbean Interlude” by Ann Vanderhoof. This foodie travel book follows Vanderhoof, a former book editor and her husband as they give up their regular lives and set sail on their 42-foot sail boat from Toronto to tour the crystal blue waters and sun-drenched islands. A lively adventure and a glimpse of the colorful food, people, history and culture of the Caribbean. If you ever have dreamed of packing it all up for your own island adventure, or you just want to live vicariously through Vanderhoof’s descriptive verse, this book is sure to warm you up. Once you’re done reading, cook up an island-inspired dish or meal that represents the book for you and post it by Friday, March 25th. Link back to this page and leave a comment here and/or email me at debinhawaii@gmail.com so I can be sure to add you to the round up. New to Cook the Books? We would love to have you join us–you can find all the details here. In my haste to get a post up about our current selection, I didn’t quite have all my ducks, (or maybe it’s mangoes?) in a row yet, so I wanted to add some late-breaking exciting news. Although she and her husband are back living, traveling, and cooking on the Receta and are currently anchored off the island of Carriacou in the Eastern Caribbean, author Ann Vanderhoof has graciously agreed to be our judge for this round of CTB and is very much looking forward to seeing your posts at the end of March. It seems you all are enjoying the book and I also wanted to mention that in other Ann Vanderhoof news, her second book “The Spice Necklace: My Adventures in Caribbean Cooking, Eating and Island Life” is out in paperback this month and in case you want to see some great travel photos, see life on the boat and explore more delicious recipes, you can visit Ann’s website and blog here.